There are many commercial systems available that you can use as is. We'll leave those for you to use following the manufacturer's instructions on safe use. Our focus here will be tailoring various commercial products to your specific needs and creating headstock workholding methods from scratch. The topic can be broken into three different sections. They are: workpiece positioning, coupling/drive; headstock mounting, and of course safety. As we develop these areas, you'll recognise some system ideas that you can develop. These will allow you to quickly and inexpensively adapt as you need for special situations. In this issue we'll explore methods of making your store bought workholding equipment do more by expanding its functionality. We will create 'adaptors' and homebuilt adaptations that will give you more flexibility, and make solutions from scratch that can help stretch your workshop funds a bit further. 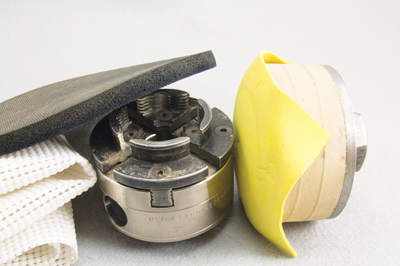 From past issues you'll remember clamping, friction, vacuum, adhesive, screw and other methods of positioning the work and providing a coupling from the material to the workmounting method. Let's ignore the lathe attachment at this point. Our purpose here is to position, support, provide material repositioning as needed, and couple the drive of this piece to the material that is being turned. 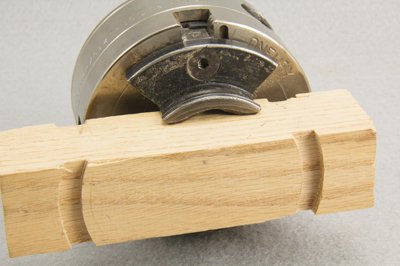 Clamping can be done with the factory jaws but you may wish to replace those jaws with something of your own design more suited to your specific needs. You can make jaw sets from many materials including wood. Some of the more interesting wood jaws are mounted and turned to suit, used with the advantage of being cut right into, and then replaced as needed. The jaws can be plain wood but certainly lend themselves to being padded if necessary. Tapered inward or outward, padded or not, stepped as needed, sacrificial if appropriate, and made to order when needed. Remember that your fasteners need to be proper and adequate. Friction drives can be padded or just tight fits. The contact surfaces can be inside, outside, or both. The beauty of friction drives is that they are turned to suit. Usually fabricated from scrap, the drive is turned to close fit and then fine tuned to be as exacting as needed. 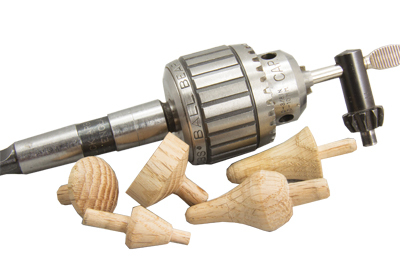 It can be used one time or repeatedly especially when coupled with an accurate and repeatable lathe mounting method. We've called these friction drives, mandrels, jam chucks, pressure pads, and other terms over the course of the series. Regardless of the name, they are very adaptable to any situation and can be part of a system for reuse. Creating your own vacuum chuck is inexpensive and quick. The properly made homebuilt vacuum chuck will serve you well allowing you to build a family of chucks at very modest cost. You can reuse your lathe mounting system, usually a faceplate, by moving it from vacuum chuck to vacuum chuck but I recommend dedicating the lathe mounting to each vacuum chuck. The time spent moving them and resealing as needed far outweighs the cost of one per chuck. Vacuum chucks work splendidly as friction drives even without vacuum applied. Mounting platens can be used many ways. Simply as a friction surface between it and the tailcentre. Vacuum can assist or be the sole means of attachment. 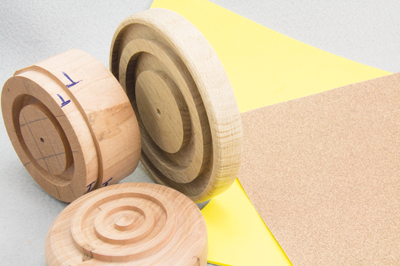 Screws, adhesives, stretch wrap, and other means can also be brought to bear. A platen lends itself to platters, bowls, or other turning where it can be positioned to the plane of the platen. It also is conducive to fastening counterweights as needed for offcentre or other varying weight distribution situations. If we now concern ourselves with fastening any of the above creations to the lathe headstock, we should be considering size and weight of the load, grip strength, positional accuracy, repeatability, cost, and durability. Perhaps there are more considerations but that will suffice for now. We have three mounting options. We can use existing equipment mounting by making modifications to it or using it as is to hold our creation, Morse taper, or the headstock threading. By thinking of your headstock mounting creations in these two areas, the workholding itself and the headstock attachment, you have huge flexibility in your implementation. Using a commercial chuck to clamp for your headstock mounting creation is so flexible that you may forego all other ideas. 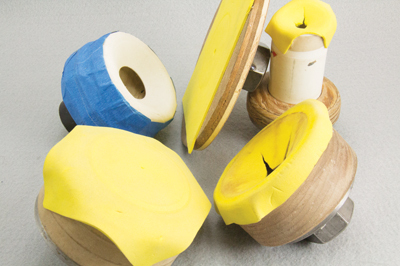 Platens, drive domes, mandrels, jam chucks, and more can easily be gripped in the existing jaws. 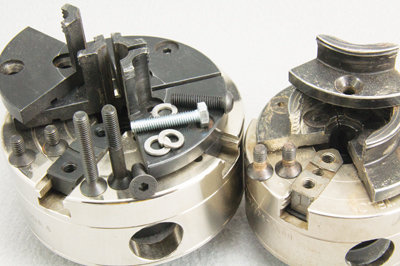 The chuck will mount accurately and repeatably so your only concern is how accurately and repeatably the chuck orientates and grips your creation. 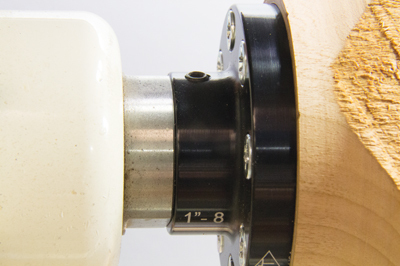 You can even mark your mounting fixture with a jaw number to position it the same way in the chuck. Turning or buying a Morse taper to fit your lathe allows you to have a positioning and drive mechanism that will let you couple your workpiece positioning piece to the lathe. A Morse taper is accurate and repeatable but is more suited to lighter duty projects. Even in steel, the mass and diameter that it can safely deal with is more limited than other headstock mounting options. That said, it works extremely well for mandrels and small precision work. 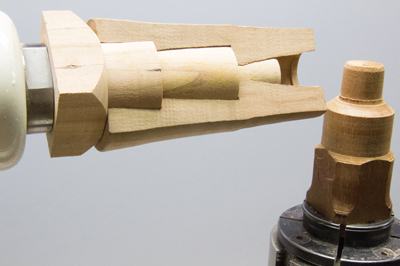 One of the most reliable and accurate positioning systems for attachment to the lathe is the headstock thread. Whether you use a faceplate or thread your device itself, this attachment method is very accurate and repeatable provided you allow the proper engagement. The coupling must engage 'ace to face' between the spindle flange and the corresponding surface on your faceplate or homebuilt creation. Counting on the thread engagement will never be as accurate as the flange to flange engagement. Faceplates can be used, removed, and remounted in the future provided you make some accommodation for accurate remounting. Using only the screw positioning might be sufficient but a small amount of effort at the beginning will pay dividends later on. Usually the cost of a faceplate is modest enough that it can be left in place dedicated to that application. Regardless of your application, whether store bought, adaptation of commercially available, or homebuilt, always be thinking about safety. Is it a suitable and proper application of the workholding equipment? Is the actual design methodology and construction of adaptors or modifications adequate? 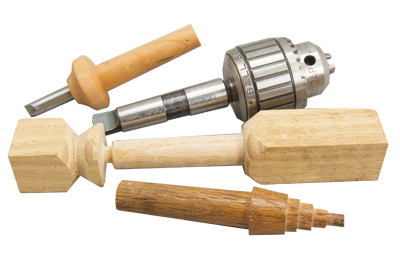 Are you trying to hold something too big or heavy in too small of a chuck, on too small a tenon, or gripping an improperly fitting tenon? Are you holding something in homemade jaws adapted to your chuck that are insufficiently designed or constructed for the task required? Are the screws too short, material not strong enough, insufficient engagement, out of balance, or other issue? The easiest way to answer the safety question is asking yourself "am I confident in this mounting method/equipment for the task at hand?" 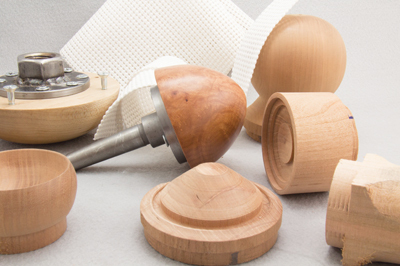 If you are cutting, your needs will be far greater than if you are sanding or only workholding for after-turning decoration such as painting. If you have any doubts or reservations, rethink, rework, and be safe. It isn't worth the risk. Good practice is to always use the tailcentre regardless of the mounting methodology. You can't be certain of the integrity of your material regardless of what it is or how sound it appears to be. 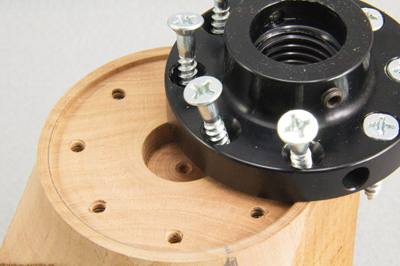 Your tailcentre will always add value to your workholding method. It can be an ally in any workholding mishap by helping to contain things 'between centres' even if it really isn't between centres in the strictest sense. It can aid whether the mishap is a material or a workmounting failure. 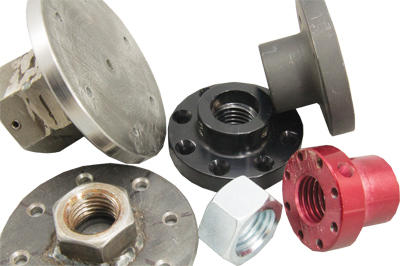 Any adaptations or accessory parts you make need to be sound and properly secured to the factory equipment. Use the same number of fasteners as well as the same quality and strength. Just because the thread sort of fits and you can get a few turns of engagement doesn't make it sound. Be aware of close fitting but incorrect interchanges of metric and English sizes. When you have any doubts about the strength of your jaws, plates, adaptors, or other shop made items, use them only for lighter duty where you are confident they are safe. Regroup and create what is necessary to be strong enough for your desired application. There are many ways to mount your work. 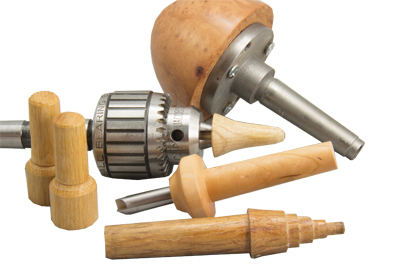 Depending on your turning, it may be a one-time speciality mounting or an ongoing homebuilt 'production' style system. Regardless of your needs, I believe there is a way to safely hold anything for turning. While the integrity of the material itself is always a huge consideration, we can buy, adapt, or create a method of securing the material for turning. Think first about ways to include your tailstock into the equation. It always adds value. When you use it until forced to remove it, the headstock creation becomes much more effective and safe. Don't forget to think 'systems.' Think along two paths. What interface will secure and drive the material? Then, what will allow you to secure that interface to the headstock? 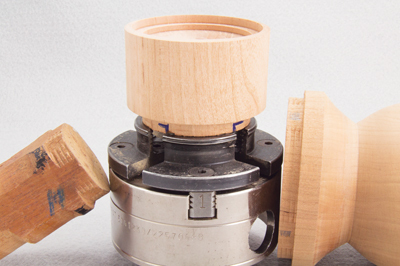 The marriage of these two ideas will let you create virtually anything you'll need in your woodturning endeavours. Always be safe but don't be afraid to be creative.